Haines Borough is a rural community with a high cost of living and a low per capita income ($32,300) — which makes it difficult to attract and retain young residents. Tourism and commercial fishing are the main economic drivers. There are over 420 business licenses, over 100 independent artists and artisans and two long-standing Tlingit communities—Klukwan Village and Chilkat Indian Association. 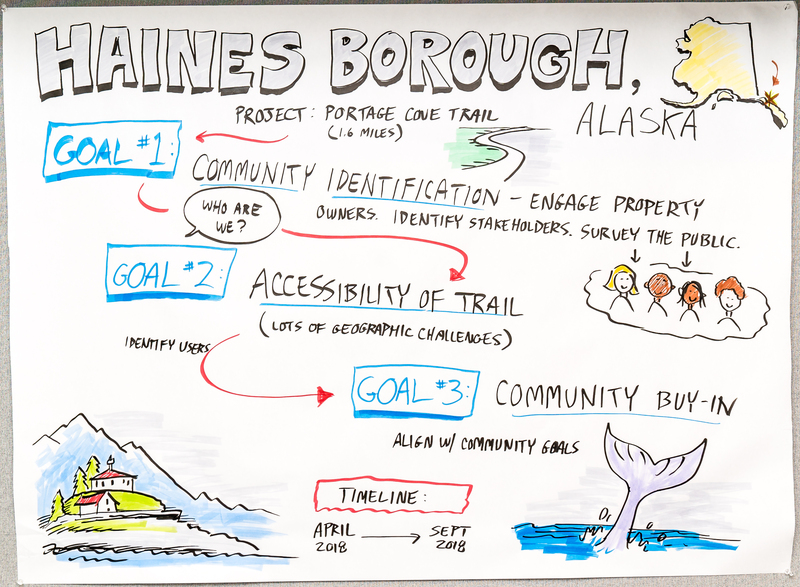 The residents of Haines Borough love their community, from the mountains to the water to the local opportunitis, but they do not always agree on the community's identity. While arts and cultural events and attractions—Native and non-native—have always been an important part of life in the Chilkat Valley, the arts are not viewed as integral to the fabric of the community. The borough is now looking to establish a cohesive community identity as it works to design and build a 1.6 mile trail to connect the harbor to the downtown and beyond. Goal #1: Community identification to create a cohesive community message around the trail. Engage property owners (state, county, private, etc.) because want them to be on board with the trail and be part of the decision making. Identify stakeholders (fishing industry, community leaders, etc.) who can help make this trail happen. Get public to engage in the planning process at the beginning rather than the end. Goal #2: Design the trail with accessiblity in mind to ensure everyone in the community can enjoy the trail. Identify geographic and topographical challenges. Design trail with accessibility in mind. Goal #3: Establish community buy-in. Nurture and maintain relationships with all stakeholder groups.